Download the first 3 chapters FREE from this site, then purchase the full eBook at BigWorldNetwork.com or Amazon for only $5.99. 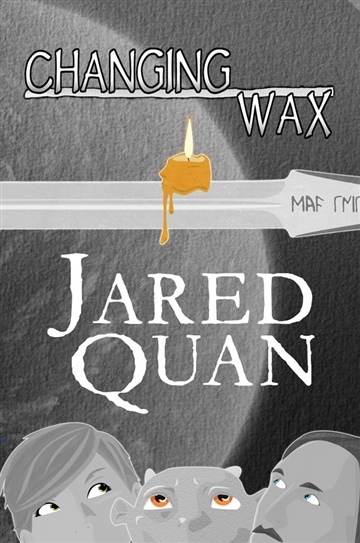 Changing Wax is an action adventure comedy, taking place in the fantasy world of Wax, which resides just seven hundred sixty-two thousand, five hundred twenty-two million and five light years from Earth (give or take half a light year depending on Earth’s rotation). Wax revolves around rules established in the ancient Master Book of Magic, rules that don’t always follow basic logic or sanity. The story follows three adventurers: Gorath the misfortunate monk who can’t seem to get anything right, Odd Drip the Imp who is too smart for his own good, and Thomas Twostead, a teenage girl born on the wrong side of Wax’s never-ending war between Light and Dark. In the end, their teaming up might decide the fate of the world, while seemingly defying the will of the Master Book of Magic. Or are they…? Jared’s childhood was split between Phoenix, AZ, and Snowflake, AZ. Jared’s sense of writing and adventure was established with the help of his fourth grade teacher. She introduced him to authors like C.S. Lewis and J.R.R. Tolkien. This was combined with the stories of his grandfather as a Seabee with the U.S. Navy during World War II, and the stories of roles the Quan (Guan) family played in the romancing of the three kingdoms in China (184 AD – 280 AD). He possesses a great deal of love for history and war. Jared achieved a milestone with his book Ezekiel’s Gun getting published in 2010, an adventure/spy novel. He has hopes to have several more books published in the future. He would like to travel the world and see places like China, Europe, and South Korea.